Click the button below to add the Copper Range Hood "Hacienda" to your wish list. If you are into old European kitchen decor this hacienda copper hood for range oven is a perfect choice. It is a tall hood with gently sloping body and small chimney that can be customize for length. Model '0248' vents to the ceiling or back to the kitchen wall. It comes in wall and island version and various standard sizes. Customize it by choosing copper finishing as natural, honey, antique or coffee. The range hood on the product page image was manufactured in coffee. If your intention is to furnish it with your own ventilation insert, select $200 custom work option. Once you provided the insert brand and model, we will prepare the interior for the insert installation. This hacienda copper range hood can be shipped with a simple 200CFM fan, light and removable filter. On average it takes five weeks to deliver. 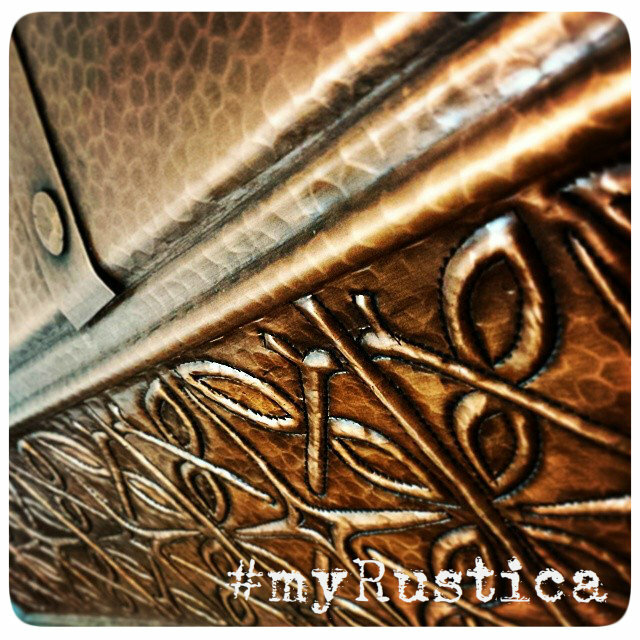 Rustica House recommends an experienced in handmade appliances contractor installing this hacienda copper range hood to assure trouble free functioning. Do not use abrasive cleaner, brillo pads nor sharp brushes. Use warm water while washing gently with nylon brushes. Dry with a soft cloth or paper towels. Don't allow long contact with acidic food and citrus fruit. Products like orange juice, ketchup and limon may discolor copper.